When you think of a full-size seven-passenger SUV, your first thought is probably not about fast acceleration or a zippy driving experience. For those in the market for a people mover, you usually care more about cargo space in the back, good fuel economy, and safety features. After all, an SUV is made for picking up the kids at school, not winding around on a country roads at fast speeds. Interestingly, the Sorento carves out its own niche. Kia calls the Sorento a “Crossover SUV” and that moniker makes sense. The 2011 model is a stark departure from the competition, though, with a V6 engine (in the SX AWD version we tested) that provides some surprising acceleration. The Sorento seems like a smaller car. From the outside, it has that typical crossover look with slight curves, raised edges on the hood, and a hunched look that suggests a small interior. Yet unlike many other crossovers (like the 2011 Chevy Equinox or the 2011 Mercury MKX, which have smaller engines and not as much pep), the Sorento is beefier than you think – it’s more like the 2011 Chevy Traverse or even the 2011 Infiniti QX56 in that all seven passengers have room to stretch out. Let’s cover the driving experience first. Because of the V6 engine putting out 276 horsepower at 6300 RPM, and with 248 ft-lb torque at 5000 RPM, the Sorento SX AWD almost drives like a sedan. In several situations – passing a car on a two-lane highway, speeding up to traffic on a major interstate, and even just taking off from a stop-sign – the Sorento did not have that heavy, lurching crossover or SUV feel. Instead, it felt downright sporty, and matched up pretty well with the Optima we drove a few weeks ago. That’s also surprising because the V6 version also gets good fuel economy: a very un-SUV-like 24MPG on the highway and about 20MPG around town – with the AWD version. Fast acceleration is one thing, but the Sorento is also a fun car for careening around corners and finding your way around a parking lot. It’s an odd mix of sporty mini-SUV handling, like a Honda CRV, with a similar front hood, plenty of interior space like the Traverse, and a large cargo area like the QX56. Folding the rear seats forward, there was enough room for five people on a camping trip with all the sleeping bags, pillows, two coolers, paintball gun equipment, and duffel bags for each person. For techie features, the Sorento is a bit behind the competition, especially the upper end QX56. Some of the tech features are fairly standard: Bluetooth for your phone, with controls on the steering wheel and a 30-pin connector for the iPhone or an iPod Touch. There are a few interesting highlights. One is that, unlike a few crossovers we’ve tested, media streaming from the iPhone actually worked consistently. (Some vehicles have trouble when you activate Bluetooth and use a USB cable for audio.) There are a few subtle extras – a switch to enable AC only in the rear compartment, and a button for preventing roll when you go up a steep incline and have to stop. For safety features, the Sorento has side curtain airbags for first and second row passengers, plus airbags for the driver and front passenger. The seat belts in front also use pre-tensioning before a collision. There’s also the typical stability control and tire pressure monitoring. Entertainment features are not that impressive. 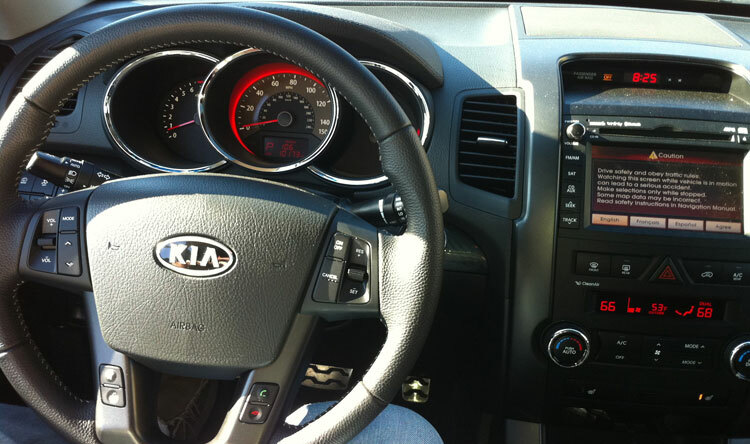 Like the Optima, the Sorento uses an Infinity stereo system with ten speakers, but it tended toward sound too distorted for the finely orchestrated indie rock we tend to prefer. If you listen to Bon Jovi and Pearl Jam, there’s plenty of audio power. There are no TV screens like there are in the QX56 and several other higher-end crossovers and SUVs. The Sorento does come with Sirius XM Radio. The large touchscreen is more responsive to finger presses than some crossovers. When you select an option, it feels more like a physical button in the response time. 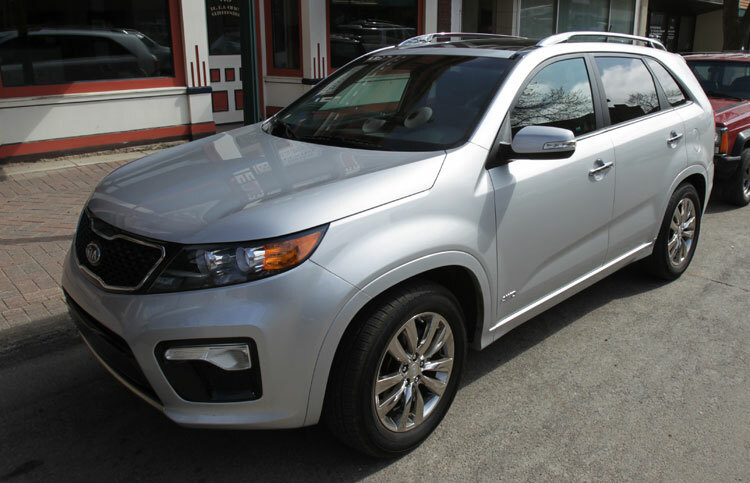 The Sorento is an overall top pick among the 30 or so vehicles we’ve tested in the last year. 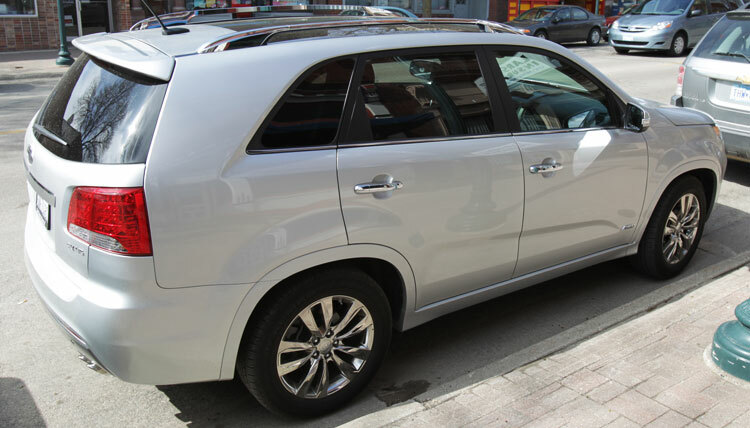 The ride is smooth and reasonably quiet, and the Sorento V6 engine is quick and responsive. We can’t even argue too much with the price: the SX version with AWD is $34,095, and the entry-level version is about $21,000. A similar version of the Traverse costs about $38,000, and the Honda Pilot costs about $37,000 with a similar trim package. The Kia Sorento is fun to drive, fast off the starting block, has exceptional space for people and their gear, and is priced below the competition. Some of the tech features are just standard in this class of vehicle, with no extra frills like the QX56. Yet, for everyday driving and those times when you want to embark on some side-road excursions, the Sorento is an ideal ride.